The lights were always dim. My IV pole machine lit a tiny sliver of green on the waxed fourth floor as you lifted your contorted body from the visitor’s chair at 3 AM. Leaving sleep in your eyes, you unplugged my machine, tied my blue hospital gown, lifted me out of the bed, stopped when it hurt me, and took me to a most vulnerable place with a tender hand. If your chair was cold, I knew you were two floors down in the NICU cradling your only child – the only one I’d ever be able to give you – making sure his IV and nutrition lines were also connected and beeping lively and skipping at the same beat as mine. You never complained when I cried in pain and loss because I was too weak to see Shiloh – but instead slipped on crumpled jeans and hospital sock from the cubby you’ve made your home in the stagnant room – and wheeled me down to see him. You made sure to tell all the nurses that Shiloh’s mommy had come. You saved his first bath for me and took the burden of the first embrace he would feel in this life because your new bride’s body was trying to leave the world. When we went home, you placed our newborn next to my slumbering body – so he would still know who his mother was and memorize my smell. I did not have the strength to hold him. As my mother slept in the other room – exhausted from the burden of seeing her only daughter struggle to hold her only son – you squeaked dry erase marker on a makeshift wall chart and nudged me awake with pills and cup in hand for my timed relief. I took the pills and placed the cup next to my bedside pharmacy. I heard more scribbles and plastic then saw you come from the pale light of the bathroom to drain the bulb of fluid still hanging from a tube in my stomach – but not a breath before making sure our little one was still puzzled into my side against his healing mother’s flesh. You prepped a bottle of nourishment my cancer infused body could not give. Our two naked scalps touched as you chose to take the hair with me. I stole your Fight Club shirt, but I know you really wanted me to wear it. You placed a flat hand on my back while I gripped the cold floor while chemo thrashed my bloodstream. In the middle of the night as Shiloh slept in his crib, you ran fingers over the tiny resilient hair sprouts as if the long dark locks were never there and this grotesque state was always what you saw as beautiful. When chemo stopped and the scans were clear, you helped drag my body back to life and shut the door and hit the lights when I tried to recover. My muscles screamed from moving when I went back to the classroom, but you muffled them with melodies of affirmation. When I said I wanted to start my doctorate, you said – “Okay”. When I said I changed my mind, you said – “Okay”. When I said I wanted to take a graduate writing class, you said – “Do it”. When I was bald, you said – “You’re beautiful”. When I dyed my hair purple and pierced my nose, you said – “This is who you’ve always been”. My Love, you never asked for this. We didn’t know how real “to death do us part” or “in sickness and in health” would try to touch us. You didn’t know your bride on a snow-capped January wedding would try to leave this world – or rather – that a beast called Cancer would try to steal me away. You didn’t know you would be both spouse and nurse. You didn’t know that Cancer’s whispers would sneak in at twilight threatening to take me again. 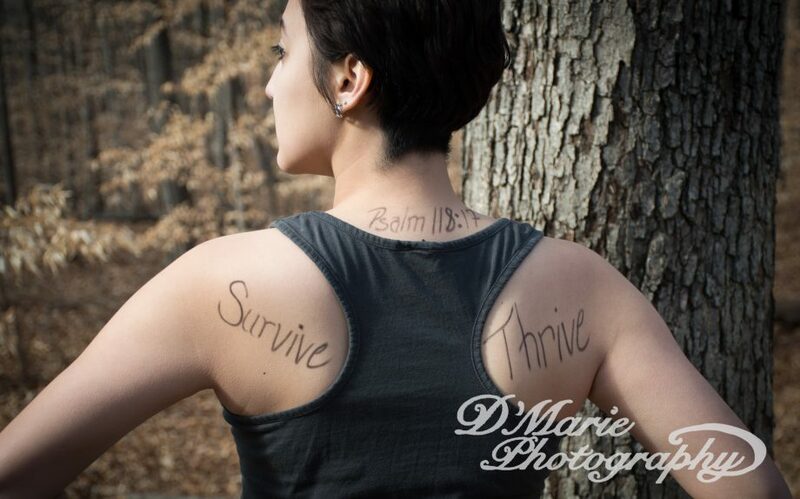 This entry was posted in cancer, chemotherapy, Christianity, faith, life truths, marriage, ovarian cancer, Uncategorized and tagged cancer, faith, recovery, survival, writing. Bookmark the permalink.